Facebook is leading social networking website.Most Facebook users have their real identity.They update personal information like School name,College name,Birth Date,Personal photographs and other sensitive personal information.Facebook profile has become online identity of most people. This makes it all important to safe guard your Facebook profile.There are many people out there trying to make use of your security mistake.They hack your profile and then steal your personal information and pictures.Worse they can imitate you and share offensive posts or pictures on your behalf. Securing your Facebook account is not tough.You can make your Facebook account hack proof by dedicating few minutes time.Recently one of my Facebook friend informed me that someone is trying to access her account.The person tried two times as per her.She asked me for help. This incident triggered me to write this post.Many Facebook users are not technical or aware of security features provided by Facebook. After login click on the icon shown below.This icon is situated in right hand top corner of the page. After that click on Security option situated on left hand side. You will see screen as shown below.We will discuss each of the options in detail later in the post. 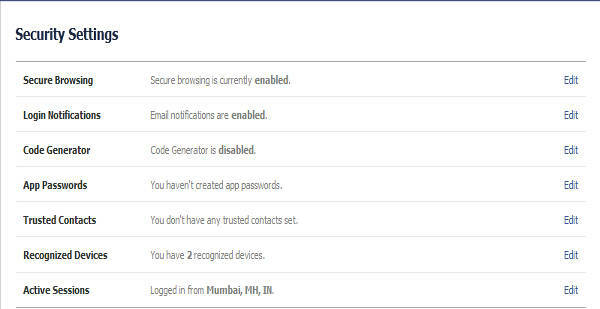 Login notifications helps you know if someone else is trying to access your account.If you have a personal computer or mobile using which you access Facebook then enabling this feature is very helpful.Facebook will send you Email or message on mobile if your account is accessed from other mobile or computer. You can select both of them.If you are selecting Text message/Push Notification then you will have to add your mobile number as well.We will discuss adding mobile steps later in this tutorial.You can select both the options of any one of them.It depends on your preference.But enabling this feature is important. After enabling Login Notifications the next time you try to log into your Facebook account you will have to select trusted computer or mobile.If you are browsing from your personal computer using Firefox then you can add that into your trusted browser.You can also add your mobile phone as trusted device as well. The devices you verified as trusted devices will be added into Recognized Devices list.You can click on that option to see list of devices verified by you.You can later remove those devices from the list as well.Below is the screen shot of Recognized devices option.You can see that Firefox browser on Windows is added as Recognized device along with the date as well. You will not be notified by Facebook if any one tries to access your account from these devices.So you should only add your personal computer or mobile as trusted device.Do not add cyber cafe computers as trusted devices. This is extra layer of security provided by Facebook.If you have trouble accessing your account then you can ask for security codes from your trusted contacts.After entering that security code you can esily access your account.This does help you if you do not have any trusted device as mentioned above and is not able to access your mobile. 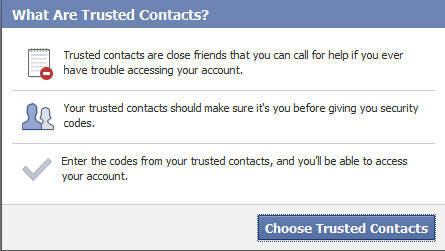 Click on the Choose Trusted Contacts (in blue).After click you can see a popup windows similar to below image.Facebook gives you an idea about Trusted Contacts.On this window you can click on Choose Trusted Contacts button to select contacts from your friend list as your trusted contact. You need to send SMS to a number.In above case F letter should be send to 51555.After sending the SMS you will receive a confirmation code.Enter the confirmation code in the box.You can also select below options (in abov image these options are not selected).It depends on your requirement or interest to select or not select these two options.They do not add any value to security. 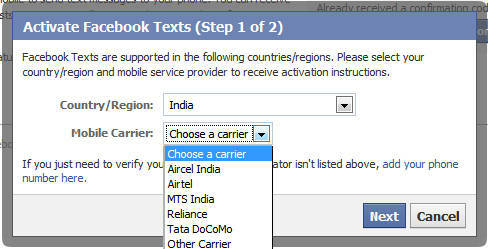 Now click on Next button.After this you have successfully added your mobile to Facebook account. Making above configuration changes will enhance security of your account.But you should also be careful from your side.The most important point is Never share your primary Email address with any one.If a person knows you primary email id then he/she can guess your password.If your password is not strong then you are in trouble.Now making above changes will notify you if someone is trying to guess your password.As mentioned above you need to change your primary email id as well as password in that case. 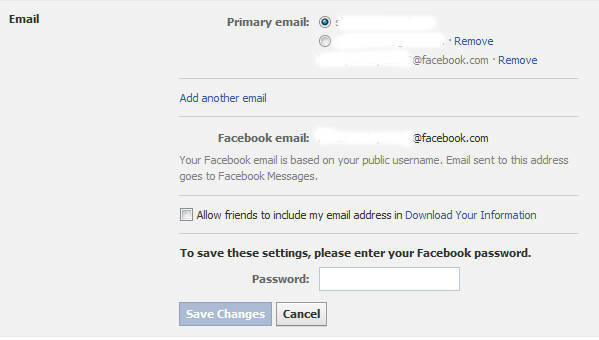 Lets discuss the process to change your Facebook primary email id.Primary Email id is the email id you use to log into your Facebook account. On the Security Screen only Click on the General Option situated on left hand side top.After clicking on general option click on Edit link next to Email option.You can see the screen as below (I have deleted the user information from below screen). On this screen Click on the Add another email option.You can add another email of yours.After adding the email you should make your new email id as primary email id.So the person knowing your old primary email id can not access your account even if he/she correctly guesses your password.It is always good practice not to share your primary email id with anyone (more importantly with persons you do not know). On this screen only you can see Password option.To change your password click on edit link next to the password.You will have to enter your old password and then new password two times to change it. If you have followed all steps then you can be rest assured that your account is now protected.Following these simple tips will help you secure your Facebook account from most of the hackers.But nothing is 100% fool proof.Someone might take advantage of Facebook bug and try to get access to your account.But you should not worry about that.